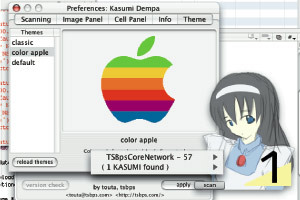 Scan KASUMI-DEMPA(means Wireless LAN wave) around you, and show stat with graphic. Show the count and details of found KASUMI-DEMPA, and even connect it now ! no english document included, but english localed. You can customize application with select (or make) Theme File. 3 Theme Files default included. More files, get from here. Developped and checked on MacOS X v10.3 (Panther). Not work on MacOS X v10.2.8 (Jaguar). More screen shot , see Japanese page. [ tsbps.com / product / support / document / staff / download ] -- TSB program system.